The ultimate 57-LMH600PKG is a self-leveling laser which has which has proficient and quality features that derive its functionality. Has high accurate level at± 3/32 in @ 100 feet, and working range of 2000 ft. Laser wavelength of 635 nm. Has power of (4) ”D” Batteries. 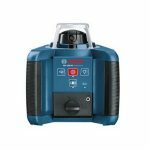 It can stand any humble and harsh work conditions as it has a variable fast speed rotation that gives the laser precise visibility. 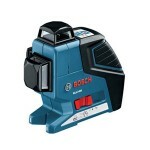 Has a dual beam that gives vertical plumb and dynamic speed rotation for exterior and interior purposes. It has a dual slope function that gives it power to offer special working areas like roads, grading and paving, trenching, irrigation and many more. This laser levels itself vertically and horizontally through electronic sensors which are connected with motors and precise software to eliminate re-leveling. 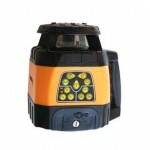 Thus kit contains self-internal anti drift features that gives the user easy time when on contract with busy worksites, it performs this through an alarm system that alerts the operator on the movements state and reason, the movements might be caused by tripod adjustment, ground settling or in the cases of accidents. This dual slope function gives the laser the ability to work on special sites like: airport jobs, land-fills, road preparation, irrigation, trenching, pipe lying among other duties on very separate ground sites. It further has Scanning feature that helps in increasing its visibility at set angles of 10, 45, 90 and 180 degrees. The 57-LMH600 laser has an exceptional accuracy of 1/16 at 100 feet and a diameter working range of 2000ft when used as a package with laser detector. This machine has a self-leveling degree of +/-5 (horizontal and vertical axis), and this eliminates guess work in the laser set up. 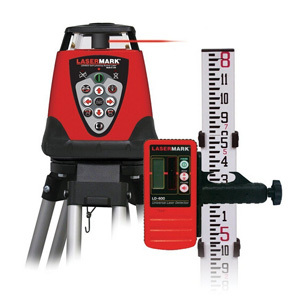 The 57-LMH600PKG also has a unique beam positioning system that aligns the machine dot in a plumb down position when working in vertical mode this gives the operator to position the laser over a mark. 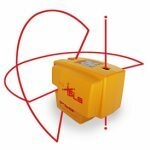 The 57-LMH600-PKG laser level has dynamic rotation speeds of 0, 150, 300 and 600RPM this makes the laser level ideal for not only leveling using the detector, but also when projecting visible laser lines walls and grounds or surfaces. The adjustable Laser Chalk-lines, act and counter re-act on beam alignment there by increasing the competence of the laser. The 57-LMH600 has been designed to with 4 D cell alkaline batteries that are capable of running the laser for more than 75 hours. Incorporated in the unit is power usage rate indicator that shows the gradual battery use, on top of this it has a sealed beacon that protects the unit and allows it to work on all climatic conditions. The 57-LMH600 has a 2 years warranty from the manufacturer, within which it can be surrender to the manufacturer in the case of any collateral damage. 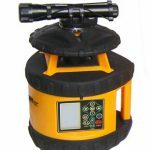 This is an ideal level laser for contractors and commercial purposes, favorably in the areas where there is shortage of power supply. The alkaline battery power holding capacity of more than 75 hours without break outs credits the machine. If you are considering that precise, accurate, outdoor, classic and easy to use laser, you are at home. The best quality for the season. 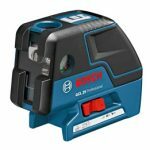 Johnson Level and Tool 40-6529 Review – Does It Get the Job Done?